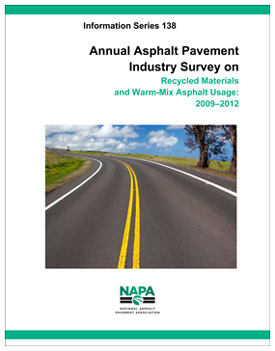 The latest NAPA/FHWA survey of asphalt producers' use of recycled materials and warm-mix asphalt find that nearly a quarter of all asphalt produced during the 2012 construction season was produced using warm-mix asphalt technologies. The survey, conducted by NAPA under contract to FHWA, found that about 86.7 million tons of WMA in 2012. This is a 26 percent increase since 2011 and a 416 percent increase in the use of warm mix since the survey was first conducted in 2009. The survey also found that about 68.3 million tons of reclaimed asphalt pavement (RAP) and 1.86 million tons of reclaimed asphalt shingles (RAS) were used in new asphalt pavement mixes in the United States during in 2012. For the first time since the start of this survey in 2009, the amount of RAP and RAS used by producers exceeded the amount collected. Producers were also asked about ground tire rubber, steel and blast furnace slag, and other waste material repurposed into pavements. Although national estimates of usage were not calculated, survey respondents reported using more than 1 million tons of these materials in 2012. The 1.86 million tons of RAS is a 56 percent increase over 2011, and a 165 percent increase since 2009. Since 2009, RAS usage has been reported in 37 states. RAP usage showed a modest increase from 2011 to 2012; however, the 68.3 million tons used in 2012 is a nearly 22 percent increase since 2009. The survey was conducted in mid-2013. Results from 213 companies with 1,141 plants in 48 states and Puerto Rico, along with data from 36 State Asphalt Pavement Associations, were used to calculate industry estimates for total tonnage. A full copy of the survey, including state-by-state appendixes can be downloaded from www.AsphaltPavement.org/recycling.